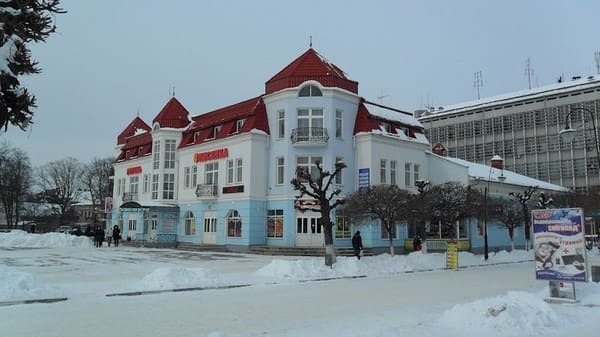 The cozy hotel "Pysanka" is located in the historic center of the city of Kolomiya, next to the only museum in the world of fisanka painting. 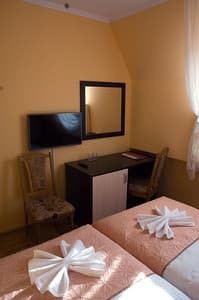 The hotel has 23 rooms, each of which is equipped with all necessary accessories for comfortable living: comfortable furniture, TV, free Wi-Fi access. The hotel offers a conference hall, a restaurant with national and European cuisine, a shop, a banquet hall for 55 seats. Transfer and excursion services are also provided at the Pysanka Hotel. Distance to the hotel from the railway station - 2 km, Ivano-Frankivsk - 60 km, GC "Bukovel" - 82 km. Description of the room: One room with a hallway and a bathroom. Room size 18 sq.m. There are 2 single beds or one double bed, flat-screen TV. Description of the room: One room with an entrance hall and a bathroom. The size is 20 sq.m., 3 single beds, a flat screen TV, a soft armchair. Description of the room: One room with an entrance hall and a bathroom. Size 20 sq.m., double bed, flat screen TV, refrigerator, wardrobe. Description of the room: One room with an entrance hall and a bathroom. Area of ​​the room is 30 square meters. There are 4 single beds that can be moved, a flat-screen TV, a wardrobe. Description of the room: Two-room suite with bedroom, living room, hallway and bathroom. In the room there is a double bed, a flat screen TV, a refrigerator, a wardrobe, upholstered furniture. Номер люкс, не совсем люкс, плохие полотенца, халаты, плохое ванное наполнение, нет тапочек, совсем не убирается балкон, все в птичем помете. Стоимость явно завышена. Расположение отеля отличное, добираться удобно. Центрально расположена, сбоку от знаменитого музея Пысанок. Чисто! Цена-качество! Отдельные диванчики детям приготовили. Над Завтраком надо ещё поработать. Стандартные меню - это в прошлом. Ну не ем я намазанный вами бутерброд и кофе не пью растворимый. Children under 12 years without extra beds are accommodated free of charge. Extra bed is available for a fee. Breakfast can be ordered for a fee. Breakfast is served in the banquet hall of the hotel. Near the hotel there is a restaurant. The hotel is located in the center of Kolomyia near the Pysanka Museum. The distance to the railway station Kolomiya - 2 km, Ivano-Frankivsk - 60 km, GC "Bukovel" - 82 km.